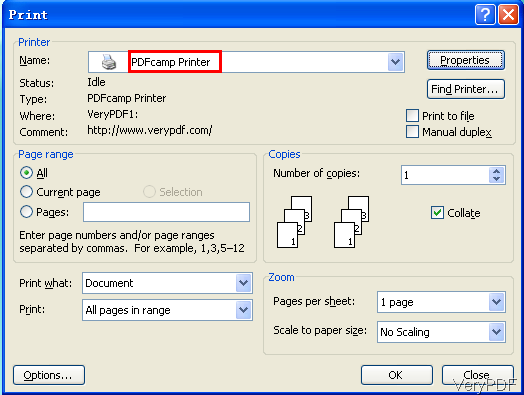 By the latest version VeryPDF PDFcamp 64-bit, you can convert any printable files to image and PDF. With the new added Batch PDF Editor, you can edit PDF in various aspects like set basic information, set password and so on. In this article, I will take converting Office to image for example to show you how to use this software. 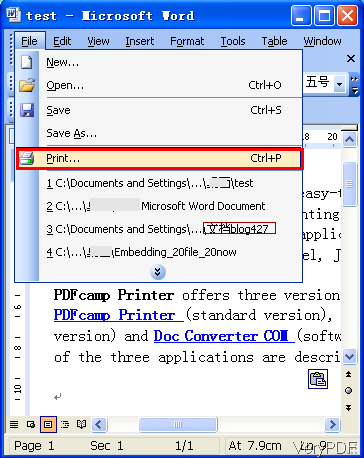 By the updated version, this software can work in all the Windows system both of 32-bit and 64-bit even if we named it as PDFcamp 64-bit. Once downloading finishes, please install this software by double clicking the exe file and follow installation message. When installation finishes, there is no icon on the desktop. Please find it in printer list. Step 2. Print Office to Image. First print word to png image. Please open word document and then click option File. In the dropdown list, please choose Print. Please know more from the following snapshot. Then you will enter another dialogue box, please choose PDFcamp as virtual printer. If you do not need to do real printing, those options are useless. But if you need to do the conversion together with printing, those options will help you a lot. Simply click the button OK then the printing process will be launched at once. A few seconds later, Save as dialogue box will show up where you can choose save the word to any kinds of image formats. Meanwhile, you can also do the setting part in advance. Please go to Start then Programme last find VeryPDF PDFcamp 3.0. 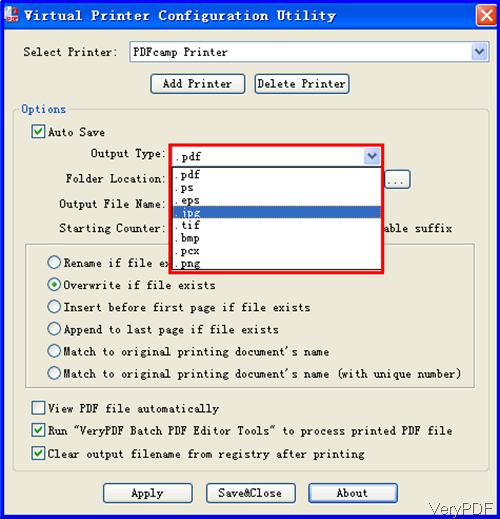 In this package, you can find an option of virtual Printer Configuration Unity. Please click it then you will see the following snapshot. From the output file format list, you can know that by this software you can convert image as ps, eps, jpg, tif, bmp, pcx, and png. When you finish setting part, please click button Apply and then Save& Close. This software is not a professional tool for converting Office to image but it is really good at converting any printable files like Open Office, MS Office, PDF, Auto CAD file and others to PDF and image. Compared with other Office to Image converter, this software is really cheap. It only sells at $29.90 without paying other fee then you can use it the whole life. Meanwhile when you need to covert Office files to image together with PDF, this software is a nice choice for you. During the using, if you have any question, please contact us as soon as possible. How can I print a TIFF image to PDF file? This entry was posted in PDFcamp Printer and tagged office to image. Bookmark the permalink.